With a warm welcomes, it is our pleasure to share the knowledge with you. EFR was founded in 2006 as accredited Training Institute and Certifying body from ASCB UK. EFR provided various high impact, quality, productivity, occupational health and safety and environmental auditing, research and training for various organizations. On the other hand, EFR also provide soft skill programs on effective leadership, dynamic teambuilding, customer service excellence and innovation tools which will help cater for your organizations human resources development. EFR Group consist of EFR Management and EFR Certification, offers expert resources for HSE, quality & productivity improvement through training, auditing, research for publication and audio video production. 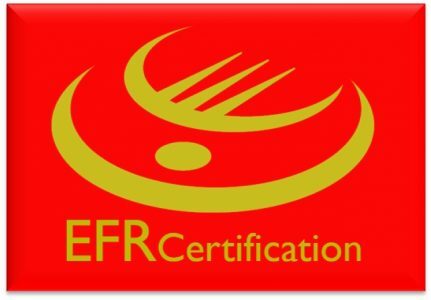 EFR provide the best value and most efficient way to certify to various management system certifications i.e. ISO9001 QMS, ISO14001 EMS, IATF16949 (Automotive Quality Management System) and ISO45001 OSHMS. EFR also appointed as associate for many other organizations such as Malaysia Productivity Organization (MPC), Asia Productivity Organization (APO) Tokyo, and Industrial Engineering and Operation Society Detroit, USA. In Malaysia EFR shared best practice and EFR understand the local culture very well and all the EFR services are adaptable to local customer needs, cultures and customs. EFR look forward to share the world class best practice with you. organizations to penetrate the local, regional and international markets. We have developed long term relationships with accreditation body ASCB Europe to provide confidence, reliable, and value added services with integrity with our client worldwide including Europe, America, Philippines, Vietnam, Iran. Qatar, Pakistan and many more. Our experience auditor from various field and areas of expertise include quality, environmental and safety management systems, productivity improvement, and supplier audits. EFR has highly experienced trainers consultants and specialists that provide VALUE, BEST PRACTICES for successful implementation of the management system either Quality, Environment or Health and Safety solution. Our Implementation approach ensures working with our clients to deliver all best practices their businesses and management system needs according to ISO or OHSAS requirements, minimising implementation time and risk. Our long term client include Astro, Johor Specialist Hospital, GDC KLCC (Petronas), Rikevita, Serimax, PTPTN and many more. EFR is accredited certification body for ISO9001, ISO14001 and ISO45001. Own renowned certified clients include Weststar Aviation, Sherwin Williams, Holchim, Perkasa Trading (Sabah Sedco) and many more. EFR conducted various research and training in Quality, Productivity and HSE issues i.e. auditing, risk management assessment, ergonomics, work stress and published various guidelines on Quality and HSE subjects. The LFP relocation program, “TOTAL REVAMP” the current operation and bring back the process to drawing board. This due to current operation was not properly design with no connectivity with product, material and people flow, inventory are everywhere and space was not maintain. This approached commonly name as greenfield approaches. The total revamp ROI and saving can be as short as one-year operation. We have assist in factory relocation from China to Malaysia, and factory consolidatio from 3 separate locations into single location. In several case the factory relocation program provide additional capacity increase and modernised the operation. ONLY IN 2019, we have SPECIAL PROGRAM FOR ONLY ONE COMPANY for LFP Relocation program in Johor, Malaysia. Certificate in Mechanical Engineering, NCUK Univesity Teknologi Mara, Malaysia, 1996. “FELLOW Academy of IEOM”, Highest membership level awarded by Industrial Engineering and Operation Society (IEOM) Southfield, Michigan, USA. A lean factory production layout, creates a seamless flow of people, material and information. Well-designed lean factories prevent the build-up of inventory and excess equipment. Lean layouts facilitate visual management. They provide a safe, clean environment to expedite work, regardless of the finished goods being produced. Lean environments can have a positive effect on workforce morale. And it’s all about effective use of time. It is easier to clean and straighten the worksite when there’s little in the way of excess equipment, tooling, and inventory. A well-designed layout will contribute to the ease of maintaining a safe and effective workplace. And, if it’s easier to maintain, it will be maintained! Lean factory relayout into a value-stream layout within the same facility is called a brownfield approach. Others choose to move into a completely new facility, a greenfield approach. While the greenfield approach is preferable to most everyone, it’s not always practical or affordable. Greenfields have their own series of pitfalls. While it is almost easier to have new machinery installed in a new plant, that’s rarely the case. Can you accelerate the production process to create a window of down time to move equipment? Can you outsource some of the production to another facility or supplier? Our expert will conduct assessment, regardless of the your organization location and goals. We managed at least 5 projects per year especially for Malaysia Productivity Corporation and SME Corp valuable clients. Process redesign tackle the bottleneck process in order to increase the production output through several strategy including Autonomation. The bottleneck process was identify from our rigorous method of operational process diagnosis.